Gold and coral jewelry? Check check. Chocolates, coffee and wine gift baskets? Check check check! And then there’s this shop across from the Porta Nolana, an ancient gate into the city. 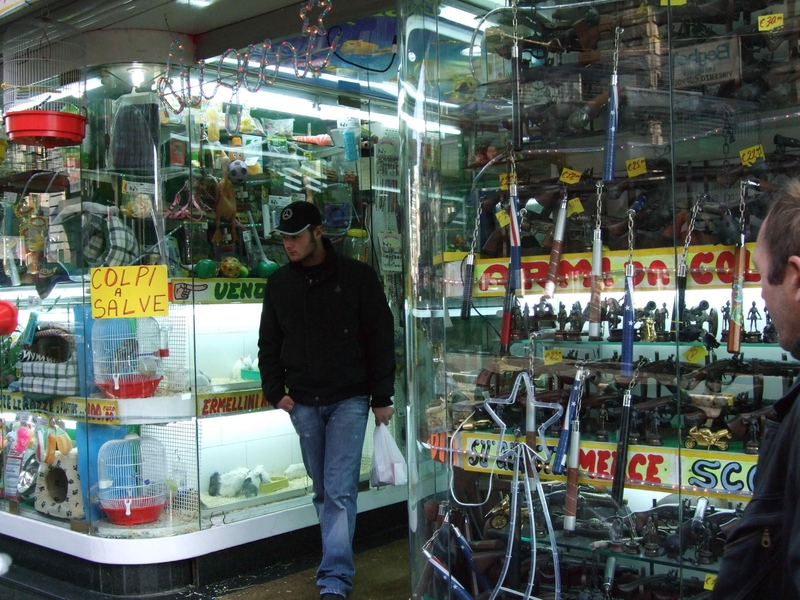 Close to a bustling open market near the train station, it’s the ideal high traffic area for this merchandising match made in heaven: a pets and weapons emporium, where you can buy live ermines and blanks, parakeet cages and nunchucks galore. The perfect place for everyone on your list: biped, feathered, furred or finned. I’m surprised the NRA hasn’t contacted Wal-Mart with a similar idea. But then that would put the multitudes of small, independent pet-and-gun store retailers over here out of business.